State Fire Marshal Stephen D. Coan asks residents and visitors of Massachusetts to set a good example for your children and leave the fireworks to the professionals. Our Boston personal injury attorneys are urging you to enjoy the many displays of fireworks supervised by local fire departments and conducted by licensed professionals instead of attempting to put on your own shows. If you chose to have some fun at home, it’s important to make sure that the fireworks you’ve got are legal in the state. “While fireworks may be purchased legally in other states, it is illegal to bring them into or through Massachusetts,” said State Fire Stephen D. Coan. In the state of Massachusetts, firecrackers, torpedoes, skyrockets, flares, candles, bombs, wheels, colored fire, fountains, mines, and serpents are all illegal. Sparklers are still legal though. But remember that they can still be dangerous. Sparklers light up your Fourth of July with their crackling glow and glowing trail of light. Kids of all ages are in awe of the sparks that fly around Fourth of July celebrations, but these devices are merely wire sticks that are dipped in a mixture of metals and chemicals and set on fire. Doesn’t sound too safe, does it? Remember that these pretty little devices can also heat up to nearly 2,000 degrees. It’s easy for parents to believe that sparklers are safer that ordinary fireworks, but the truth of the matter is that they’re just as dangerous and it’s time to stop overlooking the dangers. According to the Consumer Product Safety Commission (CPSC), close to 20 percent of all firework-related injuries are actually the result of sparklers. Young children account for a majority of these incidents, too. 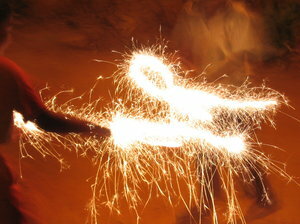 -You never want to hand over a lighted sparkler to another person. Make sure that you give then one that’s not been lit let. If you’re letting a child hold one, make sure that an adult light it. -Only use one sparkler at a time. You don’t want to intensify the dangers by adding more in the mix. -Remember that fireworks are still hot long after they’ve gone out. When they go out, confiscate them from children and place them directly into a bucket of water or under a running hose. -Never allow children to play with any kind of fireworks without the proper supervision of a competent adult. -Only purchase sparklers from a reputable vendor. Each year, there are about 200 people who wind up in an emergency room every day during the month around the Fourth of July. Don’t let it happen to you. Be safe and have fun out there. Happy Fourth of July! If you or a loved one has been injured in an accident, call the Law Offices of Jeffrey S. Glassman for a free and confidential consultation — 1-888-367-2900.